Simon Roberts (b.1974) is a photographer born and based in the UK. He graduated with a first class BA Hons degree in Human Geography from The University of Sheffield (1996). His photographs have been exhibited widely with recent shows at the Museum of Contemporary Photography in Chicago and the Museum of Modern Art in Shanghai. They are represented in major public and private collections, including the Deutsche Börse Art Collection and the Michael G. Wilson Centre of Photography. In recognition for his work, Roberts has received several awards including the Vic Odden Award from the Royal Photographic Society (2007) – offered for a notable achievement in the art of photography by a British photographer, a National Media Museum Bursary (2007) and the Bright Spark Award from the Magenta Foundation (2006). He was also a student on the World Press Masterclass in Amsterdam (2003) and identified by Photo District News as one of their PDN30 Emerging Artists (2004). Motherland, his first monograph, was published by Chris Boot Ltd in 2007 to critical acclaim. His next book, We English, will be published by Chris Boot Ltd in Autumn 2009. Roberts is represented by The Photographers’ Gallery in London and Klompching Gallery in New York. Using the perpetual dusk of the far North, Roberts encapsulates the natural light that was available for only a few hours each day during Polyarnye Nochi (Polar Nights), the period from December until mid-January when the sun remains below the horizon. This ethereal light has been depicted by many artists from the master realists of the nineteenth century, to the latest art house film directors: Zviagentsev, Khlebnikov & Popogrebsky and Kravchuk. Its haunting blueness has inspired artists to convey the bitter cold of winter and the hardship it brings for the people that inhabit this extreme climate. Like Motherland before it, Polyarnye Nochi is a testament to modern Russian life and can almost be viewed as a ‘road movie’. It is a photo narrative, in the tradition of social documentary; and as such can assume a similar description to that of ‘cinema’ itself –the projection of still images through time. Thus Roberts’ work blurs the line between photography and film. He captures the sound track to this photo-narrative, bringing his images to life. The viewer can almost hear shouts from the military base, sounds of engines (whether truck or plane) and the eerie clanging of metal on metal of an abandoned ship creaking in the frozen, wasteland waters of the Arctic. Roberts’ cinematographic style is arguably his visual lingua franca. Yet the influence of film makes up one of the many layers of Roberts’ work; other influences include: cultural geography, sociology, anthropology, exploration of identity, history and Russian landscape art of the nineteenth century. These artists exposed, in muted tones of oil and pastel, the grey sky, the vast open planes and forests of their Motherland. These later became inspiration for film directors and photographers alike in their handling of film color and composition. ‘Mother Russia,’ an age-old theme, in Russian visual art, pervades not only Polyarnye Nochi but Roberts work, as a whole. This image has been drawn upon countless times in classic and contemporary Russia cinema. It has been used by Tarkovsky in ‘Nostalgia’ and ‘Andrei Rublev,’ by Konchalovsky in ‘Asya’s Happiness,’ by Mikhailkov in ‘Barber of Siberia,’ and Sokurov in ‘Mother and Son’. ‘Mother Russia,’ presented by director, takes on many forms. At times, she is lush and fertile, at others raw and barren. 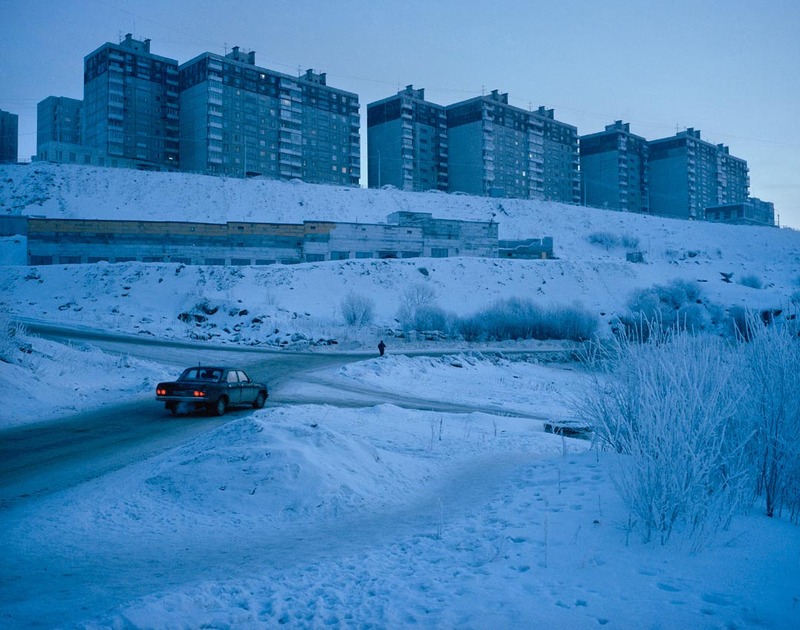 Roberts encapsulates Russia’s brutal beauty and her desolate terrain on his medium format camera. His images bring to mind the snow covered planes of ‘Andrei Rublev.’ Both photographer and director merge with ‘conjuror, forger and creator’  of Russia’s image, conveying the organic essence of a land, pervaded by spirit. Boundaries are blurred whether photo or film, dream or reality. In Polyarnye Nochi, Roberts alludes to the half light between the reality of subject and the surreal quality of image. Often he balances the dream-like property of subject matter with the use of a long exposure to render as much detail in the photograph as possible. Many artists, from Tarkovsky to Roberts, have recorded the fleeting nature of human existence, in the face of Nature’s might and permanence. This has been a common thread through the work of Shukshin, Sokurov and Zviagintsev. They depict the impermanence of life in the vastness of a natural setting. Roberts’ photographs of abandoned vehicles consumed by snow suggest that we are all but passing through. A sense of the insignificance of human existence in relation to the enormity of nature is evoked at times by Roberts’ composition. Vast cities like Monchegorsk are framed, in context of endless terrain. Like Konchalovsky and Tarkovsky, Roberts uses wide angled shots to convey the immensity and timelessness of the Russian land. The figures in Robert’s photographs make a similar point. Anonymous and ant-like, they are dwarfed by their surroundings, silhouetted in the bleak, melancholic beauty of their environment. These hunched forms seem to embody a resilience and an acceptance. In history, the Russian people personify an endurance that enables them to survive great privation and maintain an eternal hope and optimism despite the hard reality of daily life. This strength of the human spirit is traditionally regarded by them as being grounded in nature and spirituality. Nature is the link between the human and the godly. In ‘Mother and Son’, Sokurov camouflages his actors into the composition of each frame, in woods or garden, dusty path or plane. Roberts’ images of abandoned vehicles suggest a returning to nature, a regeneration facilitated by an organic consumption into the bowels of the earth. Tarkovsky’s ‘Andrei Rublev’ witnesses a holy bell being dug from the earth, alluding to the divine spirit of the Rodina (Motherland). For Russians, to return to nature is to return to ones roots, ones Motherland and ones soul. Polyarnye Nochi captures this unearthly quality of spirit and a sense of the Russian soul that is all pervasive in this harsh land. What is this elusive contradictory sense of Russianness that artists and directors, past and present, have captured so beautifully, so concisely, that seems to escape words? It has been said that Russia, for the foreigner and the native, cannot be understood by reason alone. Soul is required to attempt to comprehend the innate dichotomy of a people and land that lie under the weight of a glorious and tragic history and a legacy of suffering. V. Nabokov, Lectures on Russian Literature, Harcourt, New York, 1981, p. 2. V. Nabokov, Lectures on Russian Literature, Harcourt, New York, 1981, p. 4. V. Nabokov, Lectures on Russian Literature, Harcourt, New York, 1981, p. 3.